Corneliu Zelia Codreanu was born Cornelius Zelinski on September 15, 1899 in Husi, a small, north Moldavian town, to immigrant parents Elisa Brauner and Iohan Antec Zelinski. Corneliu was the oldest son in a family of seven. I say Nordoid. He founded the Legion of Archangel Michael in Romania, dubbed the "Iron Guard" by foreign press. Nordid (Hallstat) with a minor Dinarid contribution. Not enough like the Dinarid to classify him as Noric. The first pic reminds me of Wittgenstein, who happened to be of Jewish descent. Maybee I am wrong. He approximate the Pontid type. There is nothing Nordid about him. He fit in Southeastern Europe and the Near East. He has chestnut brown hair and light eyes in one oil painting. Why not East Nordid, in the second picture he has more pronunciated malars and the eyes appear watery light, hinting on a Baltid heritage. He does not look like Lundman's Aistin=East Nordid example. He may share some characteristics with certain Nordids. However, do you consider him Nordid? Pontids look of course more Nordoid than Insular types of Iberia. The malars can be from anywhere. They seem Pontid or Dinarid. Besides, his mother had a German (Brauner, Bohemian origin?) surname. That does not make him Faelid, inasmuch that Eastern European ancestry will not automatically make him "East Nordid". Why do we call a higher-skulled, robust (overgrown etc.) Nordid in Northwestern Europe an Anglo-Saxon and an eastern one who is only different because of the higher skull (and higher frequence of blood alelle q in the populations) as "East Nordid"? Is it out of prejudice or that those in east how other elements which set them apart? Can you explain? Anyway, the pictures have a low quality and we do not know how the profile looks. Why do we call a higher-skulled, robust (overgrown etc.) Nordid in Northwestern Europe an Anglo-Saxon and an eastern one who is only different because of the higher skull (and higher frequence of blood alelle q in the populations) as "East Nordid"? Is it out of prejudice or that those in east how other elements which set them apart? Can you explain? Good questions....Anyway he doesn't look high skulled IMO or maybe because he had so much friggin' hair it's hard to tell! I always criticized Lundmann, esp. in his division of races on ground of head/skull height and its incongruent relation with blood alelles. My prime tenet was that the East European races originated from West Europe, spreading across the North European Plain into eastern direction; East Europeans differ morphologically from their western cousin in a certain absorption of pre-Mongoloid races of the Chancelid type and some Mechtoid or North African types of Cro Magnon, who bear the same characteristics thus as the Levantine Capellid groups of Meds(high-vaulted, large-headed, broad-faced, beaky but rather mesorhine noses...), the latter type is also responsible for the Atlanto-Med. incursion in the Italian pensinsula, carrying the Cardial culture with them with its initial farming techniques. 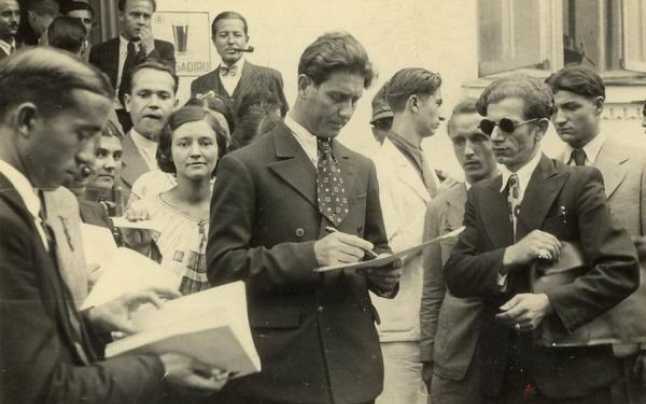 A Hero's Story: Corneliu Zela Codreanu.